Digital fashion illustrations for reference when drawing computerized fashion illustrations and for fashion design presentation ideas and inspiration. 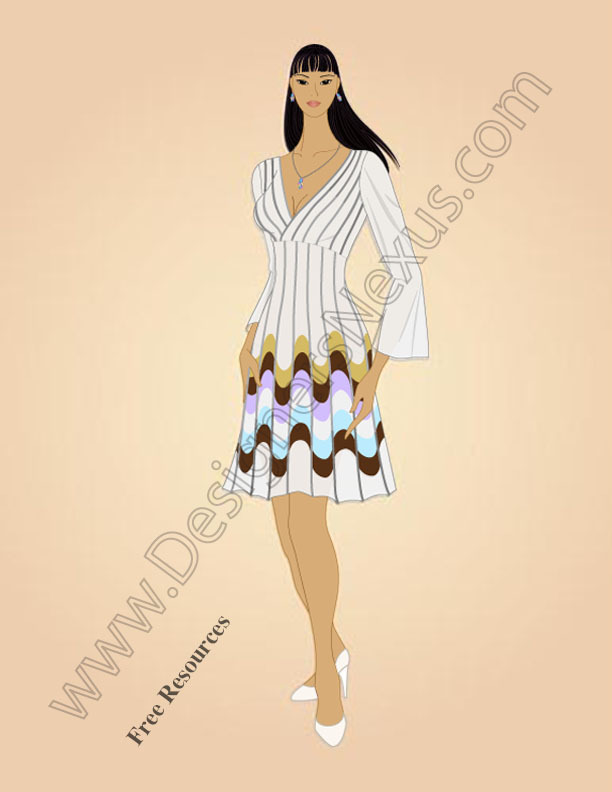 Fashion design drawing example for inspiration and reference to create your own digital fashion design portfolio layouts and presentations. Definition: A Fashion Drawing is a picture illustrating an apparel or accessory design, made using pencil, markers, pens, ink, crayons, sometimes watercolor, or basically any medium, except paint. Fashion drawing is the most popular way of illustrating fashion designs in the initial stage of design development. Designers Nexus collection of rendered fashion illustrations, digital and freehand fashion sketches to use as inspiration and fashion sketching references for form, shading, drapery folds, ruffles, gathers, pleats, & how to draw fashion sketches and accurately represent fabrics & other design details for your own fashion illustrations. Technically CADs (computer rendered flat fashion sketches) can be considered fashion drawings. However just like flats, they are very important in the fashion industry and deserve their own category.